1. The trustee, then, sells the property and distributes the sold proceedings amongst the creditors.S.S. Chapter 7 bankruptcy is a liquidation proceeding under federal law. There is a bankruptcy trustee who handles all your non-exempted properties. The trustee, then, sells the property and distributes the sold proceedings amongst the creditors. After this, you will be discharged of all debts usually within the timeframe of 4-6 months. 2. Do I need to go for credit counseling before filing bankruptcy? According to the law, it is mandatory for an individual to go for credit counseling prior to filing a Chapter 7 bankruptcy petition, unless the U.S. trustee or administrator determines that the service for the state in which the debtor resides isn’t available. 3. What is the eligibility criteria for filing Chapter 7 bankruptcy? 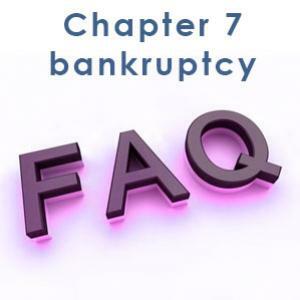 Any individual who qualifies for Chapter 7 and resides in the U.S., or does business or even has property here has the permission to file Chapter 7 bankruptcy. Irrespective of the amount of the debtor’s debt or whether the person is solvent or insolvent, relief is provided under Chapter 7 bankruptcy. However, the a discharge is only available to individual debtors, not to partnerships or corporations. The means test is used to determine eligibility for filing Chapter 7 bankruptcy. It’s an income based test, wherein your current monthly income multiplied by twelve exceeds the median annual income, based on the person’s family size. Concisely, if a debtor exceeds the median income then he/ she can’t qualify for Chapter 7 bankruptcy. 5. What is meant by exempt property? The property that a creditor can’t claim to satisfy the borrower’s debt is “exempt property”. A creditor is not allowed to liquidate the exempt property of the debtor. The property on which a creditor can claim is called non exempt property. Exempt property generally includes a person’s unpaid wage, household furniture and home equity. The appointed attorney will clearly explain about the exempt property. 6. What does a discharge mean in Chapter 7? 7. What is the eligibility criteria in Chapter 7 discharge? a. If someone is unable to prove any loss or deficiency of his or her assets. b. If a person is granted a discharge in Chapter 7 within the last 8 years. 8. Do I need to pay any fees for filing Chapter 7 bankruptcy? Mostly, you will get a free initial consultation from the bankruptcy lawyers. To file a Chapter 7 bankruptcy, it’s going to cost you around $300. A bankruptcy lawyer’s fees may vary from $1000 to $2000. 9. After filing, can I get protection from credit collection and other legal proceedings? The federal bankruptcy law gives you legal rights for protection against the creditors who harass you. The creditors are legally not allowed to garnish your wage, sue you, bring any kind of legal action against you or call you at late hours. 10. How will my credit score get affected if I file for Chapter 7 bankruptcy? Chapter 7 does have a negative impact on your credit score, but a lot less than what is already done. It’s not very difficult to get credit after filing for Chapter 7 bankruptcy. 11. Do I need to go to court after filing? A meeting of creditors is held mostly after a month of filing bankruptcy. It’s mandatory to attend that meeting. There is no judge present in the meeting, instead a trustee resides over the hearing. During the meeting, questions are asked about your income, debts , assets and expenses by the trustee and you need to answer all under oath. In most cases of Chapter 7, the creditors are not present but if any makes an appearance, they have the right to ask questions to you. 12. What will happen after the meeting is conducted? The trustee, generally, will contact you regarding your property and the court might issue certain orders also. These orders are sent by mail and you might have to transfer certain property to the trustee with certain information. If you fail to comply with these orders, your case might be dismissed. 13. What is the role of a trustee in Chapter 7 case? The bankruptcy case is overseen by a trustee, appointed by the United States, who is also responsible of collecting the person’s non exempt property and paying the expenses of the estates and claim of creditors. The trustee also has some administrative duties and is suppose to keep an eye if the debtor is following all the rules under Chapter 7 bankruptcy case. Even if the debtor has no nonexempt property, the trustee is appointed. 14. What will happen to the secured creditor after filing? Security creditors have security interest in property such as valid mortgage or lien. A secured creditor has the liability to repossess or foreclose on the secured property. The secured claims are not collected by the trustee. The validity of the claim should be proved by a court order. It will take you a lot of time to work out an arrangement with a secured creditor. 15. What will happen to the unsecured creditors after filing? Unsecured creditors have no security interest such as a valid mortgage or lien. An unsecured creditor may file a claim for the debtor’s nonexempt property, within 90 days after the first date set for the creditor’s meeting After collecting the person’s non exempt property, the trustee converts it to cash and distributes it to the unsecured creditors according to the priorities set in the Bankruptcy Code. 16. How long does a Chapter bankruptcy continues? The length of a Chapter 7 Bankruptcy case is typically 3-4 months from filing the bankruptcy petition to the final discharge day. 17. What role does the bankruptcy play attorney if I want to file Chapter 7 bankruptcy? a. The attorney collects all information to file Chapter 7 bankruptcy. b. It is the work of an attorney to prepare all petitions, schedules and statements to file with the bankruptcy court. c. The attorney is suppose to attend the meeting of creditors with the debtor and also appear at any other hearing if required. d. The attorney is suppose to analyze the financial situation of the debtor and determine if bankruptcy is the best solution. e. The attorney assists the person to obtain pre bankruptcy budget and credit counseling briefing.